Issue 39 of Lights Go Out! We are really pleased today to be able to announce Issue 39 of Lights Go Out! “A Zine Writers Special”. 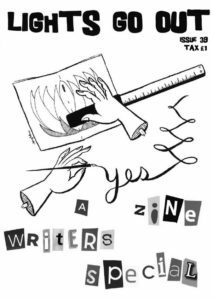 40 pages of chatting about zines, with other zinesters and the importance of self-publishing. Starring: Angry Violist. Beat Motel, Blister, Cherry Styles – The Chapess, Everything Is Fine, Far Out Zines, Flabby Dagger, Gadgie, Initoinit, Issue Punk Zine, K Zine, Maggie Lynn Negrete – mgglntCREATES, Magic Spells From The Cosmic Dragon, Mother’s Pride, NZ Zine Museum, Paper & Ink, Perfect Day, Positive Creed, Queer Content, Sticky Sounds, Sugar Paper, Svensk Apache, SW Zines & TNS. Front cover by the amazing Maggie Lynn Negrete.